This article covers step-by-step solutions to issue “There is not enough space available on the disk to complete this operation”. You may receive such error message saying there is not enough disk space on the disk when creating or resizing partitions in Disk Management, copying files, installing updates to a partition or stating an Office. If you are bothered by this problem and can’t create, shrink, extend or move partition, you can follow this guide to get rid of it. What’s the not enough disk space issue? When you try to shrink or create a volume with Disk Management, you may encounter the not enough space. The error “There is not enough space available on the disk to complete this operation” may appears in other situations. For instance, when you start a Microsoft Office for Mac program, you may receive “There is not enough memory or disk space to complete the operation”. Similar error message might be “There is not enough space on the disk” when you copy files or install updates to a volume whose free space is less than 512MB. Sometime this error is causes by disk fragment since fragment pieces are in the end of volume. Thus you can defragment your hard drive manually to see whether this issue can be fixed. Step 1: Click Start button and type Disk Defragmenter. Click Disk Defragmenter from the searching result. Step 2: Choose disk you want to defragment in the Current status section and click Analyze disk button. It may take a while to analyze whether the disk needs to be defragment. When analyzing completes, you can check fragment percentage in Last Run part. If the number exceeds 10%, you should run the defragment. Step 3: Click button Defragment disk to start the process. If you are asked for any administrator password or confirmation, provide password or confirmation. Please note that the defragment process may take several minutes or hours, and you should wait for the completion patiently. Method 2: Kill virus and clear junk files. Update your anti-virus software and use it to scan your computer completely to check for virus, malware and spyware. Ensure your computer is free from virus. Besides, you need to do some cleaning for your disk. Delete junk files and useless cache data in order to free up disk space and speed up computer. As we all know MBR disk can contain 4 primary partitions (or 3 primary partitions and 1 extended partition) at most. Please check partitions on the hard drive and make sure you are not against this rule. If there are already 4 primary partitions, you’ll not be allowed to create another primary or extended partition. Partition with low memory can be extended with free partition manger, after which the volume will have enough disk pace to complete required operations. Disk Management cannot fix all low disk space issue, as the Extend Volume options greys out in many cases. The recommended free partition manager is Eassos PartitionGuru Free which offers basic as well as advanced features for disk & partition management. 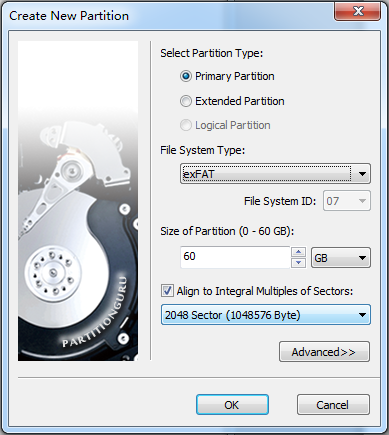 The partition resizing function is available on FAT, exFAT and NTFS partitions and it does not cause data loss. Download, install and launch Eassos partition manager on your computer, and you can follow steps here to fix “Not enough storage is available to complete this operation”. Step 1: Locate and select the partition you want to extend or shrink and right click mouse button to select “Resize Partition”. Step 2: Configure space you want to move and click Start button. Step 3: Wait for a while and the resizing process will be done. Step 1:Right click free/unallocated disk space from PartitionGuru and choose Create New Partition. Step 2: Select partition type among primary, extended and logical partition and set file system type. Then click OK. Step 3: Click “Save All” button and PartitionGuru will prompt to format this newly created partition. After formatting this partition will be assigned drive letter automatically. This entry was posted in Partition Manager and tagged not enough disk space, not enough storage is available to complete this operation, there is not enough space on the disk by EASSOS. Bookmark the permalink.